Maine-ly Marine has been a staple in the Sebago region for many years, in April the service branch of the business was purchased by employee and lead marine technician Tim Manson and became Manson’s Marine. The business is at the same location 627 Roosevelt Trail in Windham. One new addition is that they now sell Lighthouse Docks. These high-quality aluminum docks, lifts and accessories are on display outside the office. The lightweight docks provide “the perfect balance of beauty and strength.” They offer floating and semi-floating docks, a large range of lifts for kayaks, personal watercrafts, speed boats and pontoons, piling docks and gangways. Accessories include wheeled sections, bumpers, lights, swivel chairs and stairs. Options and configurations for homeowners are only limited by their imaginations. On the service side of the business, they do service calls on location at the lake. With four employees, they are kept busy in the shop and on the road. Their customers are mostly boat owners within a 30-mile radius from Windham. Delivery and pick-up are also offered for a fee. Manson’s Marine is unique because it is not brand specific. The technicians will work on any make and model. They also do fiberglass repairs, bottom paints and even detailing. At Manson’s Marine, they value their customers and go above and beyond to get their clients back on the water. They are honest, reliable and offer trustworthy repairs at a reasonable rate. 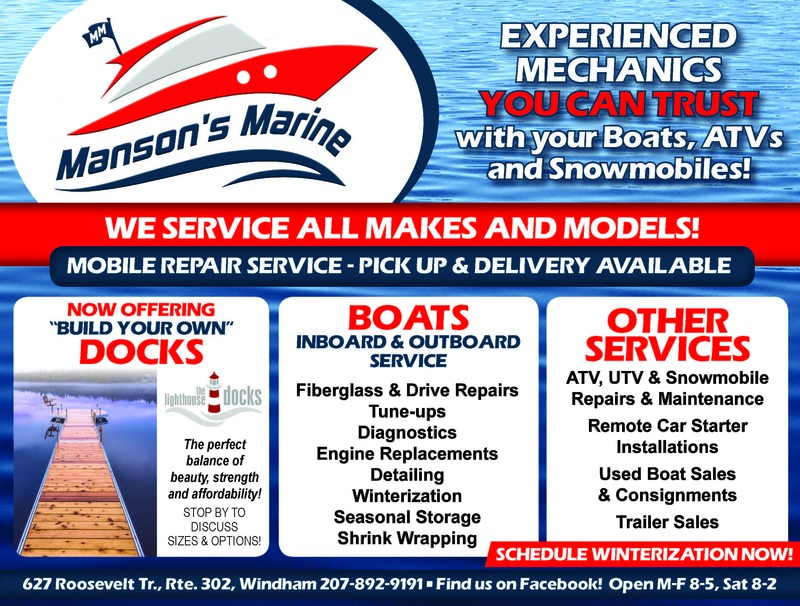 Manson’s Marine offers seasonal service as well. The do winter maintenance, storage, shrink wrapping, small engine repairs including snowmobiles and they work on generators. In the winter, the company also installs remote car starters in customers’ cars and trucks. There is a winter maintenance program they offer. The technicians will go over the boat and give an estimate for work that needs to be done. After a deposit, they will get the boat caught up on maintenance and will store it for the winter. “It’s very budget friendly”, Manson said. Manson has been spending money to update the equipment and tools they use to fix the boats and other small engines like lawnmowers and ATVs. Every winter the employees take classes to train on all boat and engine brands. They learn trouble shooting and diagnostics. The storefront is small and only carries commonly needed items like dock lines and life jackets. However, most parts can be in the next day from Manson’s suppliers. If boaters need a tube for the weekend, it can be ordered and, in the store, the next morning. There are only two boats for sale at the shop, but for those who want to do consignment, they accept those. For more information, visit www.mansonsmarine.com, find them on Facebook or call 207-892-9191. They open Monday through Friday 8:00 a.m. to 5:00 p.m. and Saturdays 8:00 a.m. to 2:00 p.m.